Набор участников в студенческие программы CCUSA на лето 2019 открыт! 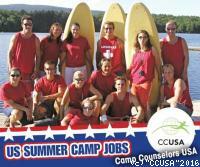 Открытие набора в программы Camp Counselors USA и Work Experience USA! Ура! Вот и открывается новый сезон программы Work Experience USA в России! И у нас сразу для Вас есть хорошая новость: стоимость программы осталась той же, что была в прошлом году! Связывайтесь со своими региональными представителями или московским офисом CCUSA! Анкета online также будет открыта для заполнения в ближайшее время! All Support Staff will be required to follow new regulations that have recently been passed by the US State Department: THIS REGULATIONS COME IN TO EFFECT AS OF JULY 15, 2011!!! 1. All Summer Work Travel Participants must contact CCUSA to check in and update us with some questions about your program so far and your whereabouts. You must do this every 30 days while on the program and you can do this by logging in to Footprints and answering the questions asked of you there. If you are unable to login, you may call CCUSA during business hours (7-5:30 pm pacific time) at 1-800-999-2267 to check in. It is extremely important that you remember to check in every 30 days, or your visa may be terminated if we do not hear from you. 2. All Summer Work/Travel Participants must remain employed for your visa to stay active. If your visa end date is set for more than 10 days past your contract end date (Check these dates in Footprints) then you may be eligible to get another job after you complete your contract at camp. If you are interested in doing so you MUST contact CCUSA for approval to get another job. 3. All Summer Work/Travel Visas will automatically end within 10 days of your camp contract end date if you have not contacted CCUSA to verify your whereabouts. 4. If you quit, get fired, or end your camp contract early for any reason, you must contact CCUSA before you leave camp. If you do not, CCUSA will terminate your visa and in that case you will not receive a 30 day grace period. 5. If you end your program early by quitting or getting fired, CCUSA reserves the right to terminate your visa for violating program regulations or not contacting us about your whereabouts at any time. The Camp Fair, where you can get yourself a placement to camp in an instant is back to Moscow! It will take place on February 18 in Hilton Moscow Leningradskaya Hotel, Komsomolskaya subway station. If you have just become a participant recently you are eligible for visiting the fair, so please check out our Camp Fair page to find out about the 14 camps attending and contact your area representative or our Moscow office for more information. Don't miss your chance to get placed in a great camp and have the best summer of your life! We are glad to announce that the applications for CCUSA 2011 are open! Please check the footprints and if you are a returnee - login under the last year's password or open a profile if you are a first timer and choose a program! Contact your area representative, if you have any questions! We would like to remind you that this season all of you, both CCUSA and WEUSA have to provide the police background checks to our office by May 15, so it is time to start applying for it now if you have not done so yet. If you are still in doubts whether or not to take part in the WEUSA program the time to decide is now. The deadline for WE Independent is April 10, so please call your area representative or Moscow office now! The embassy of the USA introduces the new requirement for the participants of the W&T programs. You have to read and understand the information at the embassy website Please review this information carefully and make sure you are familiar with it when you go to the embassy, as they may require to confirm that it is known to you at the interview. We are happy to let you know that first visas this season were granted today in Moscow! Congratulations to the brave girls who were the lucky ones! Please send your international passports to us if you have not done so yet, and you can get one too. And don't forget to check the weather report when you come to Moscow for a visa interview! Moscow is freezing these days and the interview is always a lot of waiting outside.